I’ve been vegetarian for four years and I still miss meat. I eat meat as often as possible, but since I don’t like the way 99 percent of meat is produced, I pass on it unless I can be totally sure it came from a farm that raises meat in a way that lets me sleep at night. That wasn’t an easy choice. I’d known about factory farming practices for a long time. I watched Food Inc and then had chicken wings the very next day. It was easier to convince myself not all meat came from farms like that. “Maybe if I buy the organic stuff, it’s better.” Eventually I forced myself to do a modicum of research and realized the majority of meat I had access to came from farms that treated animals in deplorable, inhumane ways. So I stopped giving those farms my money. But I do miss meat. I miss the days when I could pick up a pack of chicken breasts at the grocery store without thinking twice. I miss being able to order a steak at a restaurant without having to ask an obnoxious array of questions (and ultimately deciding it’s not worth the risk). So I was intrigued when I read Project Animal Farm—a new book that explores the realities of farming and the future of our food chain—and the author actually offered a possible solution. A possible future where ethical, sustainable farming could be the norm, rather than the exception. After visiting a dairy farm for an ill-advised vacation, Sonia Faruqi quit her Wall Street investment banking job and spent the next two years investigating dozens of farms around the world. Faruqi was on a mission to find out the truth about industrial agriculture and to see if she could find a solution to our current practices of producing massive quantities of cheap meat quickly, at the expense of the environment and the welfare of the animals we eat. Faruqi documents this research in Project Animal Farm, which comes out July 15. In her characteristic Type A fashion, she doesn’t just visit one or two farms, but more than 60 farms in eight countries across three continents. Faruqi lied when necessary (claiming she wanted to work in slaughter or start her own farm) to gain access to factory farms that raised pigs, chickens, and cows, as well as a slaughter house—all of which she describes in full, graphic detail. But she also found farms that were raising animals in a way that gave her hope for the future: using practices that were sustainable, ethical, and environmentally-friendly. MB: As a relative outsider, were you surprised when you discovered certain labels, like organic, didn’t ensure the picture of farming you had in your head? SF: I was surprised. I was surprised so often not just by the labels but also when I would visit a company website, the pictures and descriptions would be completely different from the reality. I was naive going in, I think that’s obvious, and I came to know a lot more, like learning that farms use labels such as “free range” and “organic” as scams. They’re used as a way to make more money off of the public. You touched on antibiotic resistance a bit in the book. 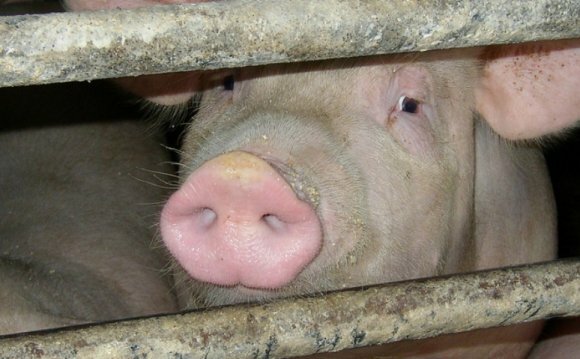 How big of a factor was that in some of the concerns you had with factory farming? I also wrote an article about antibiotic resistance a month ago. It’s definitely a problem. Antibiotics are very commonly used. I describe it in the chapter about Charlie’s pig factory farm, but in chicken farms they’re also mixed into the feed and the chickens are constantly eating antibiotics. It’s definitely a serious problem with long-term consequences that are quite likely seeing as how much they’re used. Right now, the attitude in the industry that I often saw is they don’t want any regulation even though the fact is if antibiotic resistance grows, that’s going to impact the welfare of farm animals and the livelihood of these farmers themselves. You also point out some of the negative sides to agricultural technology: how it’s enabled an even greater division between the farmer and the animals. Are there any upsides to new technology? Technology is not a bad thing, it just comes down to how it’s used. Take robotic milking: while the concept isn’t bad, as such, it generally means that cows are not going outdoors and there are no people on the farm. On the whole, that’s a negative trend because it’s not just consumers who are disconnected from how animals are being raised, but it’s also the farmers themselves who are disconnected. At the end of the book you propose a solution: large “pastoral” farms that raise a lot of animals but in a sustainable, ethical way. But would this actually be scalable to the point where it could take over our current methods? Large pastoral is a solution but this change in production method would also require a change in eating habits. Pastoral farms can have thousands of animals, like 10, 000 hens. But it wouldn’t have 100, 000. It wouldn’t have 300, 000. Some egg factory farms in the US today have hundreds of thousands of hens. Large pastoral farming wouldn’t have that sort of monstrous scale but it would have really good scale model for humane and sustainable farming. The prices would be higher but they wouldn’t be, for instance, double. And it would also mean people would need to reduce their meat consumption. If someone reads your book and doesn’t feel comfortable with current farming practices, should they go vegetarian or should they seek out companies and farms that raise animals in a way they feel comfortable with? Some people don’t want to be vegetarian but they do want to make a change. Everyone can make a difference by choosing to buy differently or choosing to eat less meat. If two people half their meat consumption, that’s equivalent to one of them being vegetarian anyway. I don’t necessarily view it as a dichotomy. Everybody can do something and I hope everybody does do something. But a lot of people don’t like to hear about this. Do you really think a shift is possible? One of the challenges is this disconnect: there are more chickens on the planet than humans by far, but how many people have actually seen a chicken? That disconnect makes it very easy for people to not care. But it’s like any other issue. Recycling, for instance, is such a norm today and it wasn’t always. I think it just comes down to people’s interests and interest is growing. If it keeps growing, it could reach a tipping point where it becomes a mainstream issue. Pispala is a city district 2.5 km from the centre of Tampere, Finland. It is located on the northern slope of Pispalanharju, the highest esker in Finland.